A little not-so secret secret? I bet they did not know the top that they were mentioning in this piece only cost $1. 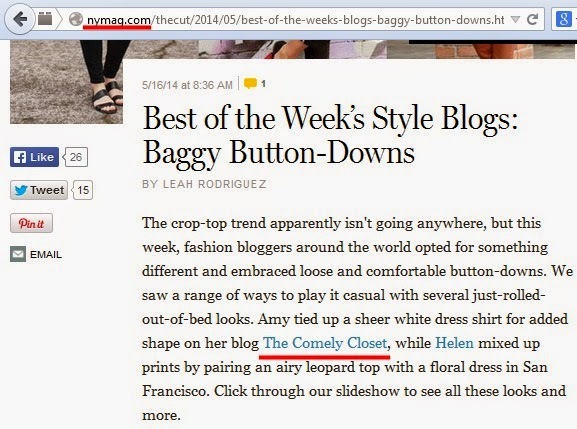 It shows you that thrifting/shopping within a means can still be highly fashionable, especially if a great platform like nymag.com features it without knowing the price. Ladies and gents, you can still express your personal style and be/feel fashionable all within a budget! I cannot reiterate this enough. If you find yourself not being able to purchase items you see in the magazines or on other bloggers, don't fret because there are always other alternatives! Yes, it can mean you need patience for that item to go on sale or to dig through piles of used clothes to find something similar, but oh does it FEEL SO GOOD when you do get your hands on it. Not only that, you can definitely find something to your personal esthetic by shopping the sale section. People think that items on sale are the unwanted, out of fashion items, but depending on how you style it and own it, you can definitely MAKE IT WORK. That's my mini rant, and I hope all you fellow window shoppers get inspired by this post and dig into those sales! You can read the nymag.com article/view the gallery here. Original post of featured outfit here.